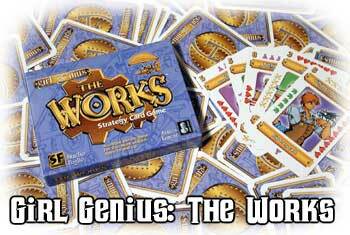 Based on the new comic series by Phil Foglio, Girl Genius: The Works is a card game where players are tinkering with a big machine made of all the characters from the comic book. The game is played using a board made of twelve cards that represent pieces of the machine, and players take turns flipping and spinning these cards trying to fix the machine. When you make the right moves you "pop" pieces out of the machine and score them, and you might even cause a chain reaction that pops several pieces at once. The Works contains a 108-card deck in glorious full color and a rulebook.